Hi, Brenton Ford here. Welcome to Feedback Friday number 25, where each week we bring you the analysis of someone’s stroke. In today’s video, we’ve only got the front shot so there’s only so much we can see in the front shot. Ideally, I’d like to have a look at the side and the front. It gives me a better perspective of things, but there’s still a couple of things that I’d like to point out in this video. The first one you’ll notice is that the swimmer here is coming through quite straight with his arms, so he’s not getting much bend in the elbows. The high elbow position isn’t quite there. The other thing you’ll notice as well as the timing or the exhilaration of the pull-through. Now when we’re swimming. Let’s just bring it back a little bit. When we’re swimming freestyle, the speed of the hand should increase as you go through the pull-through. So at the back of the stroke, it should be faster than where it moves at the start of the stroke, so it should exhilarate through. Now you can see here particularly at the back of the stroke. That right arm, notice how it’s exiting the water quite slow and there doesn’t seem to be much exhilaration throughout the pull-through. So that’s another thing that we can work on. Now looking at the pull, where we mentioned that it’s quite straight, the arm angle that we’d like to try and get to as your pulling through underneath the shoulder here is 100 to 120 degrees from the shoulder to the elbow, elbow to the hand. 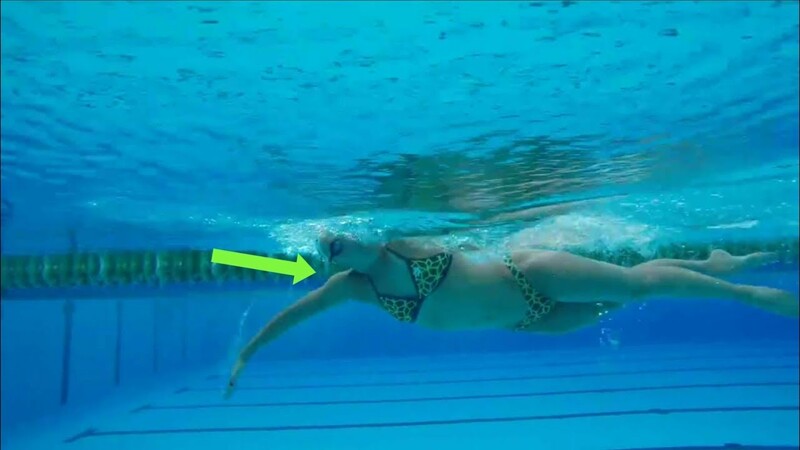 That’s where you’ll see most elite swimmer’s being, with their arm angle in this position. So he’s at about 170 degrees. That’s just too straight. And the reason, or the cause of that, is he’s just down too deep. So in order to get to that 100 to 120-degree angle that we want, he’s going to need to not be quite as deep, he’ll need to bring the hand up a little bit shallower. But more importantly, he’s gonna have to get the elbow out to the side. We wanna see the arm almost looking like half a diamond, almost like a half triangle shape on the side. That’s where he’s going to be able to engage his lats a lot better. And that is where he’s going to have a better angle with the forearm and the hand as he’s pressing back. So if you look at this with another swimmer. So this is the winner of the Rottnest Channel Swim, Solomon Wright. He doesn’t have a classic high elbow that you’ll see with a lot of other swimmers, but he’s a very quick swimmer. But he still has a very good pull-through, even though it’s not a classic high elbow position. So, you can see at this arm angle right there. So he’s at about 120 degrees with his arm, and you’ll see it’s that almost half diamond shape. So the elbow’s out to the side a bit more, fingertips are pointing down. So it’s not a huge change that the swimmer in the other video needs to achieve, but you can just see that position right there. So, here, much easier than you engage the lats, and the forearm and the hand is angled so much better to press back against the water. If we look at that from the side, ideally what we want to get to– I’m just gonna change the shot here. When you’re pulling through underneath the shoulder in this position, the shoulder, elbow, and hand should all lineup. That should pretty much be one straight line as you’re moving through underneath there. What I’ve noticed with running a lot of clinics and coaching a lot of people online through our membership is that most people have their hand too far out in front, and what that does is it means the forearm and the hand presses down in the water instead of pressing back to move you forwards. So in order to really get good power from your stroke and good propulsion, all of this has to line up underneath the shoulder. So that’s another thing that we’d work towards. Now we could look at quite a few different drills to go through this. There’s a number of drills that you can use. If you saw one of our most recent videos, which is called, “This is why it’s so hard to get a high elbow catch,” that’s got two drills in it. 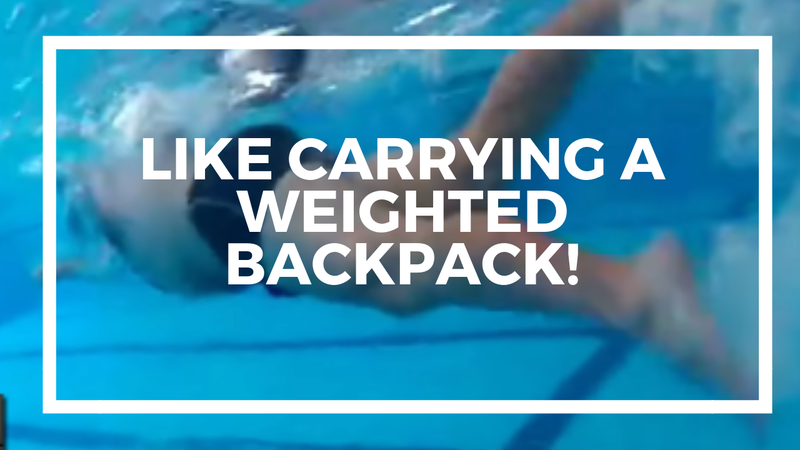 It’s got catch kick and it’s got catch-catch pull drill in there that we really liked using clinics and with the online coaching, that we’ve had a lot of success with a lot of triathletes and open water swimmers, and pool swimmers, as well. So there’s a wide range of drills that you can use, and it doesn’t matter too much what drills you use, but it’s more that you do the drills right. So you could have. You could do the best drill in the world, but if you don’t do it right it doesn’t really make a difference to your stroke. So it’s about making sure you’ve got those key elements of the stroke with that drill right and practicing those. So that’s probably what we’d look to work on with that athlete. When it comes to the exhilaration of the pull-through if we bring this back again. So you could see here with Solomon, notice how, all right, out the front in that reach phase it’s not as fast as it is through the back of the stroke, so sort of slows down a little bit as he enters and extends, then he increases his speed particularly at the back of the stroke. It doesn’t mean he needs to pull through really hard at the back, it just means that he exhilarates through the stroke there. So there are two things that we could work on with that swimmer in the other video. 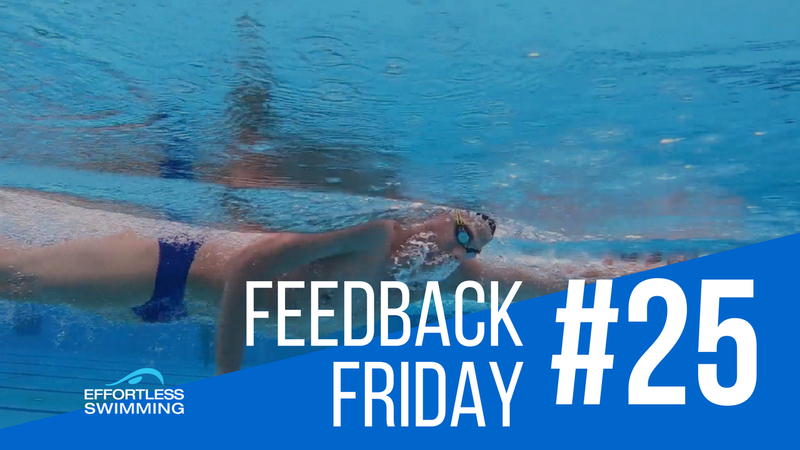 Now in the last Feedback Friday, we ran a competition giving away an A and E pool buoy. We asked you to comment, “What are you working on in your stroke?” So thank you for adding that. Let’s have a look at it. So penoir said, “I’m working on my catch, relaxing when breathing and trying to increase my swimming fitness, lung capacity. I started swimming again on March 12 this year after a 46-year absence. I was determined to overcome my fear of breathing in the freestyle stroke and it’s now day 42 and I’m over the moon that can conquer this fear and I’m now swimming one kilometer four times a week.” So that’s excellent. That’s what a lot of swimmers are working on, their catch, relaxing, really just getting to become more efficient. In swimming that’s what it’s all about. You know, effortless swimming is called effortless swimming because even when you’re going fast you’ve got to stay relaxed as you do it. And it’s really a key to swimming faster. On our Instagram, which is @effortlessswimming we’re running a contest where I want you to submit your best photo of you or a friend swimming and we’re going to feature the best picture on our Instagram over the coming week. So all you need to do is #effortlesswimming and just make sure the tag is in that photo and use the #effortlesswimming. And we’re going to feature a couple of shots, the best ones, on our Instagram in the coming week. So thanks for watching Feedback Friday. I hope you’ve enjoyed this video. We’ll be back next week with another Feedback Friday video. 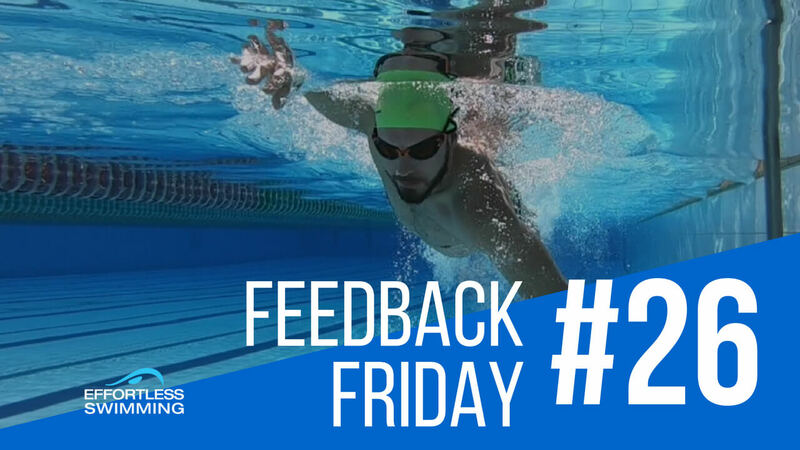 And if you’d like to submit your video, one that we could choose to feature on Feedback Friday, then you can send it to us at our website. Go to effortlessswimming.com/contact, and that’s where you can send your videos or just comment below. Put a link to your own video and we will pick one video every week to choose and analyze your stroke. So thanks for watching. See you next week on Feedback Friday.